A will is a legal document that states how your estate will be distributed after you die. The estate includes all of the assets you leave behind when you die. When creating a will, you typically nominate someone to be your Executor. An Executor is then responsible for carrying out your wishes and distributing your estate. 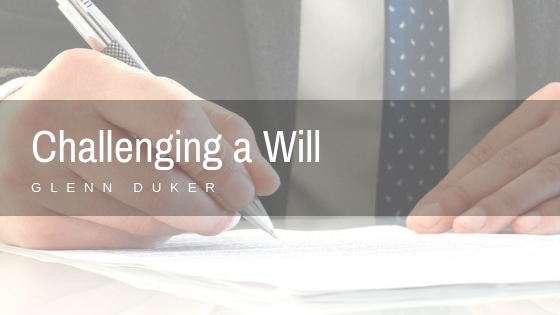 Though the will is a signed legal document, there are times where a family member or beneficiary wants to contest the will. Challenging a will can be difficult since it is hard to prove and costly, although typically the legal fees will be covered by the Estate if the claim is legitimate. A will is not valid unless it’s in writing. A will must be signed by the testator or by some other person in the testator’s presence and by the testator’s direction. A will must be dated by the testator. By signing the will, the testator must have intended to give effect to the will. The testator must sign or acknowledge their signature in the presence of two adult witnesses who must both be present at the same time. Each witness must sign the will in the presence of the testator. Though these laws are straightforward there can still be some issues to arise if the will is challenged. Usually, the testator and two witnesses sign the last page and only the last page. If all of the pages are not signed, there is no way to tell if a page was added, removed, or replaced. This could cause the Court to declare the will invalid. People grow both physically and mentally weaker during the aging process. They can become more susceptible to the influence of others, especially if they are closely related. The testator can receive threats, abuse, and constant nagging about the contents of the will from a beneficiary or someone who wants to be a beneficiary of the will. They will isolate the testator from their family and friends and even get involved with the provisions of the will. If this can be proven the will could be declared invalid. If a testator is presented with documents that are not what they thought they were signing, then the will was procured by fraud. In this case, if the will was signed in accordance with the law, the witnesses will be asked what the testator thought the will was. If the statements of the witnesses don’t correlate, then the will may be declared invalid because it was not signed properly where all parties were clear of the contents. Since the testator can’t be questioned, it does make it difficult to prove fraud. If the will is declared invalid by the Court, the estate may be treated as if the testator had no will. This could mean the estate isn’t distributed according to the testator’s wishes or there may be an increase in fees and costs which can devalue the estate.